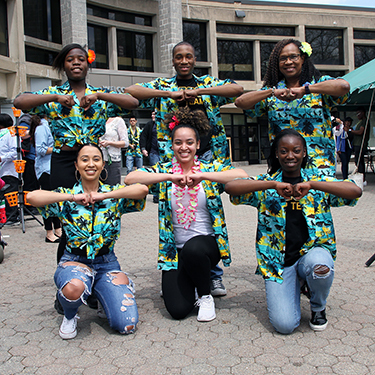 The MCCC Step Team, seen here at 2018 Spring Day, will be among the Black History Month performers. West Windsor/Trenton, N.J. – “Restoring a Cultural Legacy” is the theme for Mercer County Community College’s (MCCC) annual observance of Black History Month. This February, the college will host a number of special events with an emphasis on history, fellowship and inspiration. The events are split between MCCC's West Windsor Campus, and the James Kerney Campus (JKC). The closing ceremonies will be held at JKC. The following events, open to the public, kick off with the Opening Ceremony at Kelsey Theatre on the West Windsor Campus on Feb. 2 at 3pm. The event will feature dance routines from African, hip-hop, tap and other genres. Then, on Feb. 16, performers will commemorate Black artistry through spoken word, storytelling, African drumming and more. Finally, on Feb. 28, JKC will host the Closing Ceremony at 12pm. The Academy Award-nominated super hero film “Black Panther” will be screened later that day, first at 3pm on the West Windsor Campus (LA 229) and then at 5PM in Kerney Hall at JKC.